When someone thought about Lisbon few years ago, he could have an image of city attached to its past, small streets, hills and laundry hung between two buildings on the street. This image is always true, with emblematic areas of the city where history is still alive. 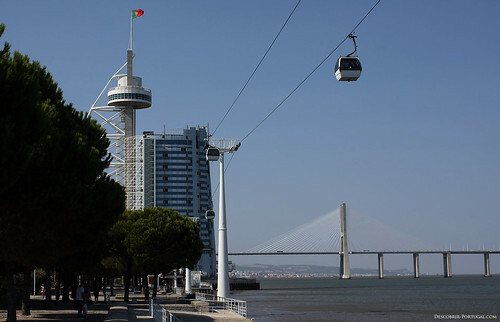 But Lisbon is also a modern city, resolutely turned towards the future. 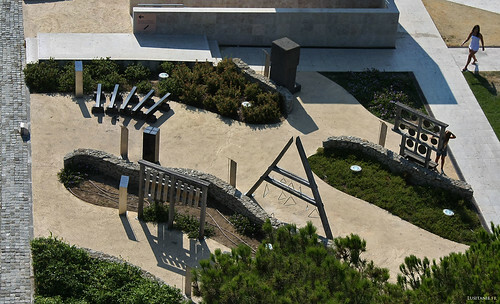 One of my favorite places in Lisbon, where the greatest architects of our time have participated is the Parque das Nações. Built for the universal exhibition of 1998, this location is the place for extraordinary architecture, what the best modern architecture is able to do. One of the volcanoes of Parque das Nações. They bring water and cool to people. Lisbon has always been a modern city, contrary to popular belief about the cities of southern Europe, several thousand years old. During the great earthquake of 1755, the Marquess of Pombal had rebuilt the city according to principles ahead of its time. Since then, Lisbon has never renounced this legacy, even under the dictatorship of Salazar. 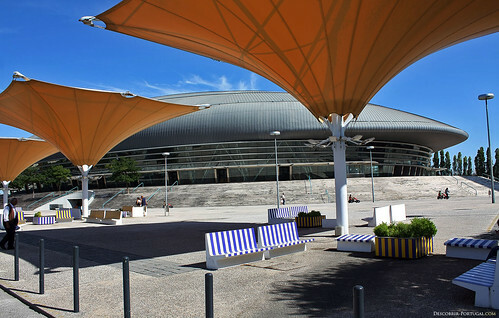 These great parasols give shade to people who want a little rest at the Pavilhão Atlântico. All began with the project of a universal exhibition at Portugal. 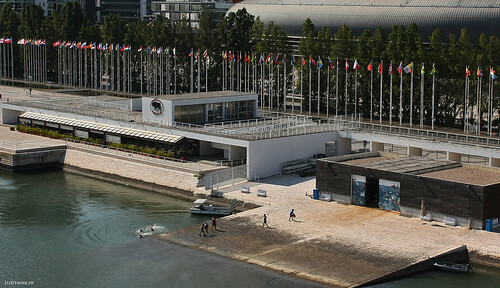 Expo 98, dedicated to oceans, had to be grandiose, and a unique opportunity to recharacterize a poor zone of Lisbon with dying industry. Located at the East of the city, the ancient port of Lisbon was abandoned for a few years. It was needed to do something. 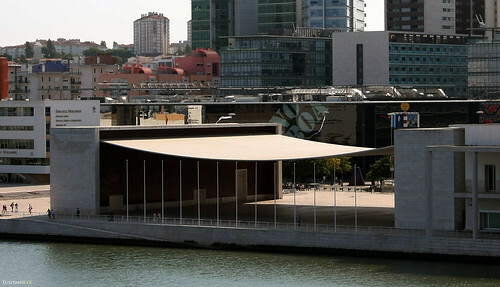 The Expo would be the unique opportunity for Portugal to show the world its know-how and its modernity, after years of stagnation. 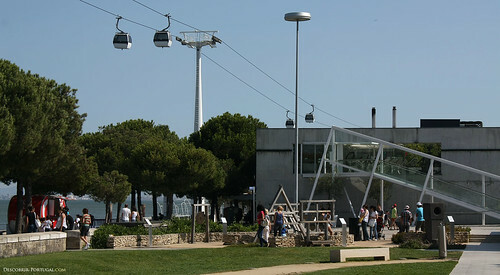 The cable-car can be seen in almost all of the Park. 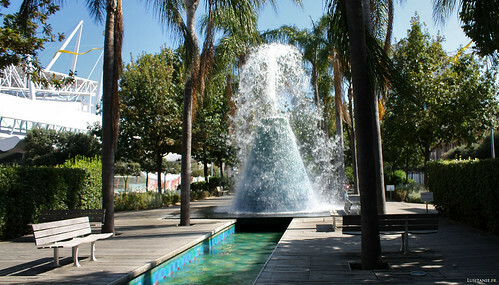 The best global architects participated in the development of the most beautiful example of Portuguese modern urbanism. Names now globally known as Eduardo de Souto de Moura or Siza Vieira, are now two Pritzker Prize, the equivalent in architecture of the Nobel Prize. Santiago Calatrava, Spanish architect, made the “Gare do Oriente”, which is what is best in multimodal transportation station: trains, buses, taxis and Metro, all gathered in the same place. At the bottom right of the picture, you can see the giant Vasco da Gama bridge. The space, formerly dilapidated, with a refinery, industrial slaughterhouses or a centre for treatment of wasted waters, is now a noble area of Lisbon, with its 5 kms on the Tagus, on a total area of 330 hectares. 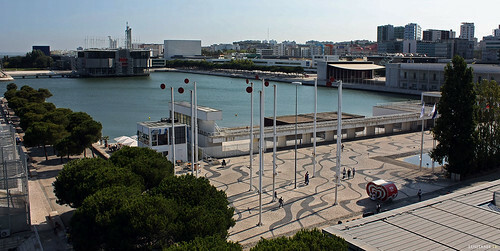 Several architectural works of the Expo 98 have become as many icons of Lisbon and Portugal. One remembers the Oceanário, giant aquarium where coexist different species of the oceans of the world, each in its element, from the penguin to the shark. The Vasco da Gama Tower, with its 142 m, is the highest building of the city, and one of the most famous silhouettes of Lisbon. 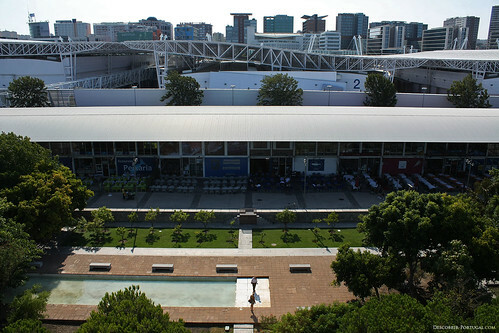 Known also, the Pavilhão Atlântico, a great arena, where people can see concerts or sports competitions for example. 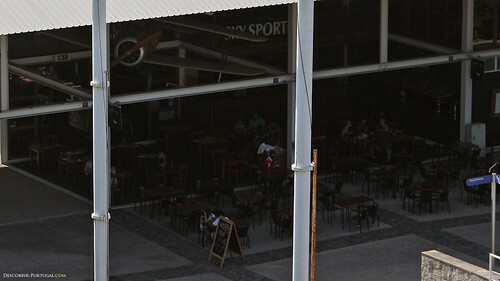 An old airplane is used in this bar as an hanging ornament. In the foreground, rua da Pimenta, with its numerous bars and restaurants. Behind, the FIL, Feira Internacional de Lisboa. Urban development is notable, everything is thought to put in first place the habitant and passerby. 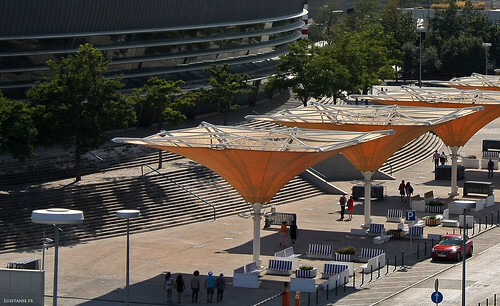 Stroll along wide pedestrian walkways, revamped by trees which, at the time of the Expo were still too small. Traffic is limited, never chaotic. Outside the Gare do Oriente, the first point of contact with the Parque das Nações is the large shopping centre Vasco da Gama. It is one of the most beautiful that I know, without exaggeration: it’s a superb idea to pour water permanently on the transparent roof. One has the impression of being in a fountain, fresh and light. Out of the other side, it’s the former Expo 98 that begins with a gigantic black sculpture, recalling a metal tree. The ride, between the trees and the cable-car. 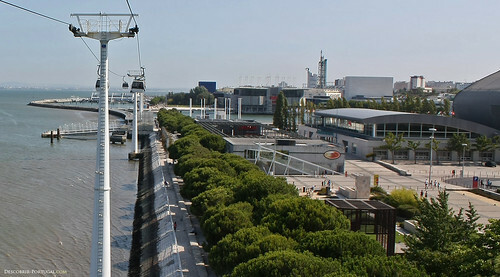 It was here that the different pavilions of expo from each country in 1998 were. Most of these pavilions were provisional, and have been dismantled since. This new district of Lisbon was designed to accommodate hundreds of thousands of people simultaneously, which probably explains the high quality of infrastructure today. But of course, everything is not perfect, and real-estate speculation wreaks havoc, as everywhere. New buildings are constructed with quality of course, but always more and more, increasing the density of the population. They demolishes “Praça Sony”, where stood great concerts in the open air, to put instead new buildings. Some infrastructures seem to be abandoned, the paint began to flake In short, the Parque das Nações is aging, much faster than expected. Pavilhão Atlântico, multi-purpose entertainement room. I hope that authorities, despite recurring economic crises, will be able to maintain what is a unique place in Portugal. Just for the volcanoes of water it would be worthy. This is an original and useful idea: they are fountains, which time to time “explodes”, dousing the more distracted passersby. 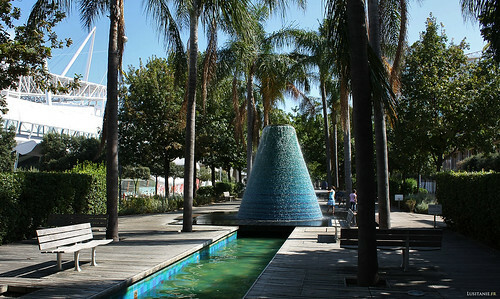 The Parque das Nações became also a place to live, where people work, or come out at night. 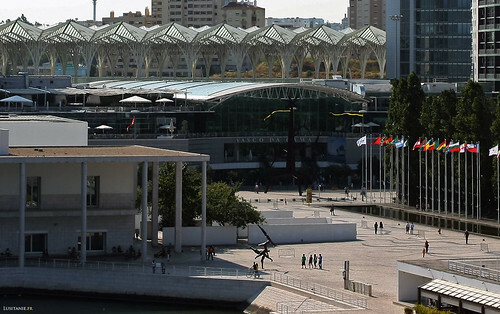 Along the old docks, today a very large driveway along the Tagus River, there are many restaurants and bars where the Lisbon people come take a drink and discuss with friends. A neighborhood like that, it’s fun. Rest area near Pavilhão Atlântico, or Atlantic Pavilion. A friendly place where you can make noises with sound objects. At the left of the great buildings of FIL, the Bojador Street. Look at the sculptures in the water… they are naked women bathing! In the background, the Lisbon Oceanarium, masterpiece of Expo 98. The well known Pavilhão de Portugal, major work of architect Siza Vieira, aided by Souto de Moura. In the middle of the picture, the large shopping centre Vasco da Gama, and behind, the Gare do Oriente, work of architect Santiago Calatrava. 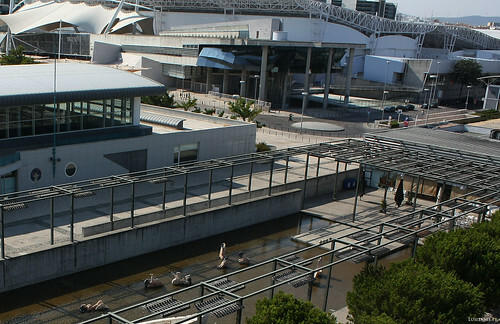 The Lisbon people like to swim in front of the Oceanarium! The flags remind us the countries participating in Expo 98. 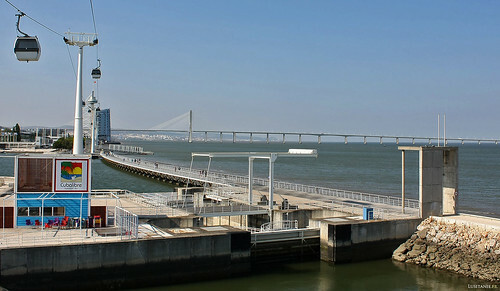 These are the gates which controls the passage between the Oceanarium and the Tagus River. February 11, 2012, 3:35 pm, "City". Portugal Discovery, February 11, 2012. Portuguese version : Descobrir Portugal. French version : Lusitanie.fr.